Not much crafting going on here, so I haven’t had anything really to write about. Same with gardening, though I bought 4 tomato plants and some basil to go in the hanging baskets yesterday. I also bought this gorgeous Mandevilla to go on a trellis out back. This morning I went to JoAnn’s for the current $3.99 Vogue pattern sale. I picked up these two patterns. I have been wanting to make a summery dress, and both these styles caught my eye. Not really sure I will actually make them, but just in case, I wanted to get the patterns while they are on sale. Now this part of the blog post is something I have been debating about actually mentioning. Since May is Lupus awareness month, I think I will share. I also have those weird antibodies, though I do not like to acknowledge them. I am really weak right now, from a major flare in March. I’ll be fine. I just need time to build my strength back up. That is why my life, crafting, and gardening have been on hold. Frankly, this is hard for me to share, though I do want to offer an explanation for not creating anything to blog about. Ironic, now that I write this, I am more aware that I need to take my Lupus seriously. Maybe it took this long for me to recover, just to drill the point into my thick head. This entry was posted on Friday, May 14th, 2010 at 1:15 pm and is filed under Life. Tagged: Life. You can feed this entry. You can leave a response, or trackback from your own site. I like the dress on the left. Especially done in a floaty fabric. I think we all have a tendency to not want to admit “problems” even to ourselves sometimes. And then we pay for it. sigh. feel better. I hope you’re feeling better soon and that your doctors are able to find something that works well for you. I was just going to ask if that was Mandevilla…one of my fave vining flowers! 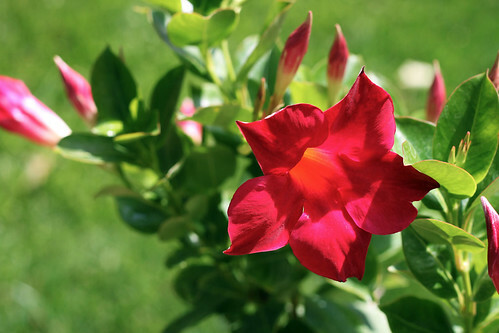 I want to get a pinkish mandevilla…put it in a largish urn and put a oh…what is it with the pretty, decorative tower in the urn and have the mandevilla creep up it…that’s what I want to do! Oh, I think that would look so pretty! It’s such a lovely plant. That dress on the left looks so comfy and cute~ the one on the left is quite pretty and summery. Thank you for sharing. I hope you feel better soon. 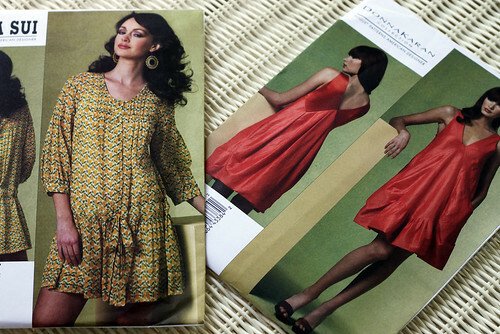 I had dresses that looked like the one on the left during one especially hot, muggy summer. They were so comfy and cute. So good to see your mandevilla – I got mine last summer as a baby plant, wintered it over in the sunroom & it is now taking over the east end of the room! Yours on a trellis will be such a sight – and so envious you can leave it outside. IMHO, I think its important to share with others – we tend to feel so isolated and alone otherwise. I know what that is like. We all share in this gift of friendship – whether it be online & scattered around the world or right down the street. Hope you are soon feeling well – take care.